Advancing the Sustainable Development Goals (SDGs) in a consistent and effective manner was the focus of discussions at a side event organized by the Governments of Sweden and Mexico, the Organization for Economic Co-operation and Development (OECD) and the World Resources Institute (WRI), in collaboration with a coalition of think tanks. 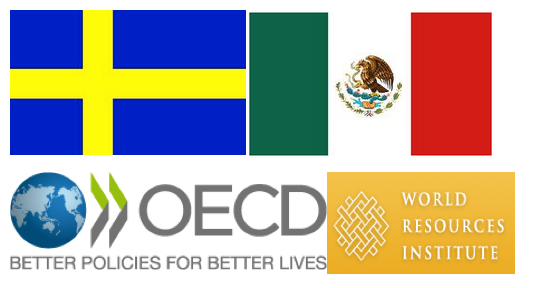 19 July 2016: Advancing the Sustainable Development Goals (SDGs) in a consistent and effective manner was the focus of discussions at a side event organized by the Governments of Sweden and Mexico, the Organization for Economic Co-operation and Development (OECD) and the World Resources Institute (WRI), in collaboration with a coalition of think tanks. Representatives of governments and international institutions shared national experiences and needed policy and institutional shift, at the event, titled ‘Ensuring no one is left behind: the importance of policy coherence for sustainable development (PCSD),’ took place on the sidelines of the High-level Political Forum on Sustainable Development (HLPF), on 19 July 2016, at UN Headquarters in New York, US. Opening the discussion, David O’Connor, WRI, noted that SDG target 17.14 calls to “Enhance policy coherence for sustainable development” (PCSD), and said those working on domestic implementation of the 2030 Agenda for Sustainable Development should communicate with those working on its international implementation. He said the idea of universality encompasses both shared humanity, by providing benefits for all, and shared destiny, by highlighting the interconnections between all countries and people. Marcos Bonturi, OECD, highlighted PCSD’s role in mobilizing financing for development, by enabling conducive investment frameworks, responsible business conducts, and a more transparent and coherent trade system. He also announced the launch of the OECD multi-stakeholder PCSD partnership. This partnership aims to: provide a forum for exchange of expertise among governments, international organizations, civil society, think tanks, the private sector, and other stakeholders on the policy implications of SDG implementation; help governments and stakeholders to strengthen their capacities for analyzing PCSD challenges, and adapting institutional mechanisms, policy-making processes, and policy coherence monitoring and reporting systems to the needs and vision of the 2030 Agenda; and support national efforts for reporting progress on target 17.14. Ardalan Shekarabi, Sweden’s Minister for Public Administration, said his government has created a national multi-stakeholder committee to facilitate the national and international implementation of 2030 Agenda, which will work closely with Swedish municipalities and localities, and develop a comprehensive action plan. Noting that Sweden is taking a “whole-of government” approach to development, he said 86 government agencies have been asked to review how their policies align with the 2030 Agenda. Luis René Martínez, Office of the President, Mexico, announced the creation of a national council for the SDGs headed by the President. He said Mexico is currently undertaking a national exercise to find national metrics for the SDG indicators. Festus Mwangi Kiunjuri, Kenya’s Ministry of Devolution and Planning, said his country’s national development blueprint, Vision 2030, provides policy direction for government institutions and partners, and is coherent with the SDGs. He reported that 128 indicators have been identified at the country level for monitoring the SDGs, that the government has developed an elaborate SDG road map to guide national implementation, and the SDGs will be included in public education.